Kitchens have cabinets and cupboards everywhere, each with a door needing a handle. Whether you want a modern, traditional or quirky look, we have a wide range of kitchen cabinet handles for sale. If you’re looking to buy kitchen cabinet handles, one important consideration is what will match the style of your kitchen. 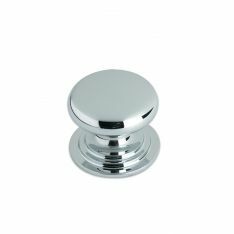 For a gleaming modern kitchen, we have options such as the Satin Nickel Steel T Bar Cabinet Handle, the Satin Nickel/Polished Chrome Square Section D Handle or the Polished Chrome Curved Cabinet Handle, all in a good selection of sizes. We also have plenty of more elaborate, traditional handles for kitchen cabinets, ranging from the 36mm Set Abbey Pewter Cabinet Knob & backplate to the Black Antique Ring Pull on Gothic Cross Backplate, or glass knobs like the Fulton & Bray Clear Facetted Glass Cupboard Knob, which comes in clear, black, green, blue and pink. Then again, you may want to make your kitchen child-friendly, and we have a selection of fun figure handles, for your kids or the kid in you. The Cebi Joy Frog is just one of a range including a snail, a butterfly, a penguin and even an alien, as well as various shapes and faces. Besides cabinet and kitchen handles, we have a comprehensive range of pull handles and plates for sale, including pull handles on rose, pull handles on plate, back to back pull handles, bolt through pull handles, face fix and cranked handles, flush pulls, kicking plates and push plates.